Arduino Projects, Tutorials, Examples and more! Electronic projects, Projects with Arduino, information about Arduino and STM Nucleo development boards and more there are! 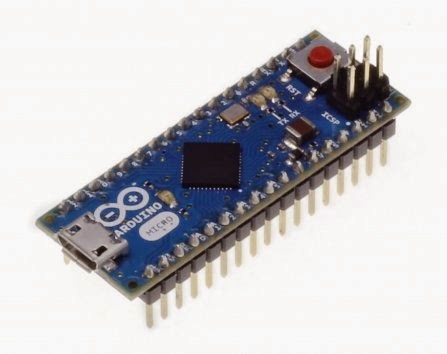 Also, solutions for your projects at Arduino Maker! We mentioned about Arduino development boards in the last writing. Now, let's meet the Arduino family closer. Though, Arduino mostly uses for hobby projects, it is useable for high level projects. To meet with this demand, Arduino family has many different members. Arduino provides that flexibity not only electronical but also physical changings. We will mention interesting and common members of Arduino family. We spoke about Arduino Uno in the first writing. 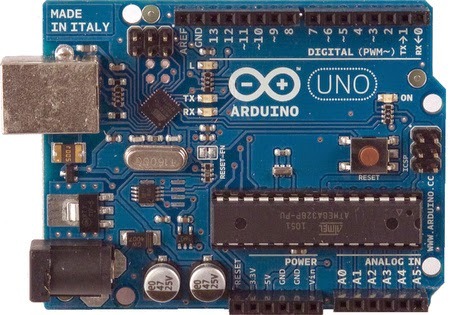 Arduino Uno is the most common model of Arduino. Creaters of Arduino suggest Uno for beginners. Arduino Uno is produced for general usage. It has an average clock speed and memory. It does not have many pin to connect and this resists its usage for projects with many sensors and motors. But, it is good for the projects, which need small quantity of component, based on software. Of course, we should take the clock speed and memory into account. Roughly, we can say Arduino Uno is very good for begining and projects like line follower robot, mini sumo robot. We said its price is between 20-25$ for the original and 7-8$ for the clon Arduino. It is very cheap on the websites like www.alibaba.com. But clon Arduino is not reliable and durable like original Arduino. Kabaca Arduino Uno için başlangıç adına oldukça güzel bir kart olduğunu, çizgi izleyen, labirent çözen, sumo, merdiven çıkan gibi basit robotların yapılmasında rahatlıkla kullanılabileceğini söylemek en doğrusu. Fiyat aralığının orijinal ürün için 20- 25$ civarlarında gezindiğini söylemekte fayda var. Ancak yurt dışı kaynaklı sitelerde, özellikle de www.alibaba.com gibi internet sitelerinde oldukça uygun fiyatlara kopya üretimlerini bulmak mümkün. Fiyatın 7- 8$ düzeylerine kadar düştüğü oluyor. Ama ucuz etin yahnisi yavan olur derler, aldığınız kopya, diğer adıyla klon arduinoların güvenilirliği ve kullanılan malzemelerin kalitesi elbette ki orijinalinin yerini tutmuyor. Another member of the family, the little child of the family is Arduino Micro. It is usable for the projects with small dimensions. It is smaller than its brother Uno; also, its properties are better. But the disadvantage for Micro is that the bootloader software, which is needed to make the Arduino programmable easily, uses bigger capacity from the memory. Bootloader uses 0.5 KB memory in the Uno but it uses 4 KB memory in the Micro. That causes from the processor. Uno uses another processor for the bootloader but Micro use the cpu, to be smaller. If we speak about reasons which makes the Micro as Micro, Uno's dimensions are 7x5.5 cm but Micro's dimensions are aproximately 5x2 cm. Their prices are aproximately same. At the same time their performances are not so different, too. All about your choise for your usage type. Micro'yu micro yapan boyutsal özelliklerine gelecek olursak Uno yaklaşık olarak 7x5.5 cm boyutlarındayken Micro yaklaşık olarak 5x2 cm boyutlarında. Fiyat olarak birbirlerine oldukça yakın fiyatlarda olduklarını söylemek gerek. Zaten performans olarak inanılmaz bir farka sahip değiller. Tamamen kullanım amacınıza yönelik karar vermek en doğrusu. Family's madcap child is LILYPAD. LILYPAD is developed mostly for wearable technology. It is very small and washable. That is a new property for a technological device but you should be sure about power off. Lilypad catches up other models with its technical properties that's why it is useful for different projects. Its price is about 25$ on the original website Arduino store. Again clon models are cheaper. 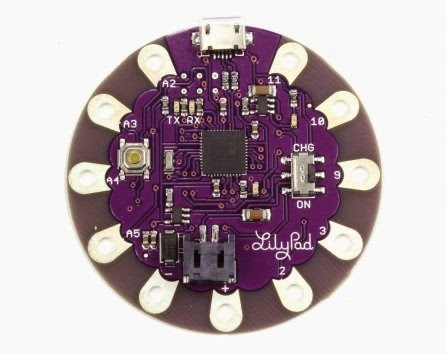 Lilypad has a circled shape with 18 mm diameter. It is like a badge which we put to our bags. If we speak about Lillypad, it is possible to make crazy and different projects. You can watch the video which is about a project with Lilypad. Let's continue with the older child of the family, MEGA. With its dimensions and properties, Mega is bigger than others. Mega is produced to use for complex and higher level projects. 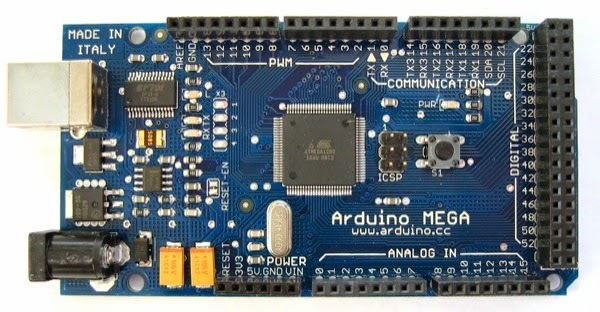 Arduino MEGA is best for the veteran users with its high clock speed, pin numbers and memory. Of course its price becomes more expensive with higher properties. Original Mega has a price about 40$ on the Arduino store. Clon models are cheaper. Arduino has MINI, NANO, YUN, LEONARDO and more models except UNO, MICRO, LILYPAD and MEGA. Arduino publishes every products as open source and it improves with contributions of developers from all around the world. 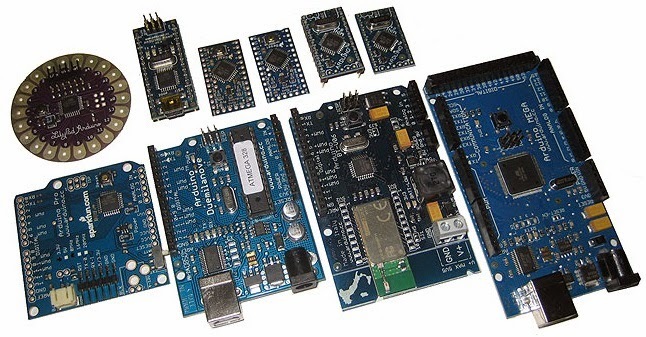 In addition, Arduino produces many devices like gprs module, ethernet module and communication module like Xbee. Also, Arduino produces t-shirt, sticker, cup, glass, accessories for the robots like body and wheel. Besides, Arduino let's you to make your own Arduino. They sell empty shield and they publish schematics of Arduino. You can make your own Arduino by using them. You can download bootloader from the internet. You should use ARM microcontroler for Arduino and you need another programmer to load the bootloader to microcontroller. We mentioned about Arduino family detailed in this writing. To learn more about Arduino you can visit official website of Arduino. We will continue with the Arduino projects in the next writings. Keep in touch!